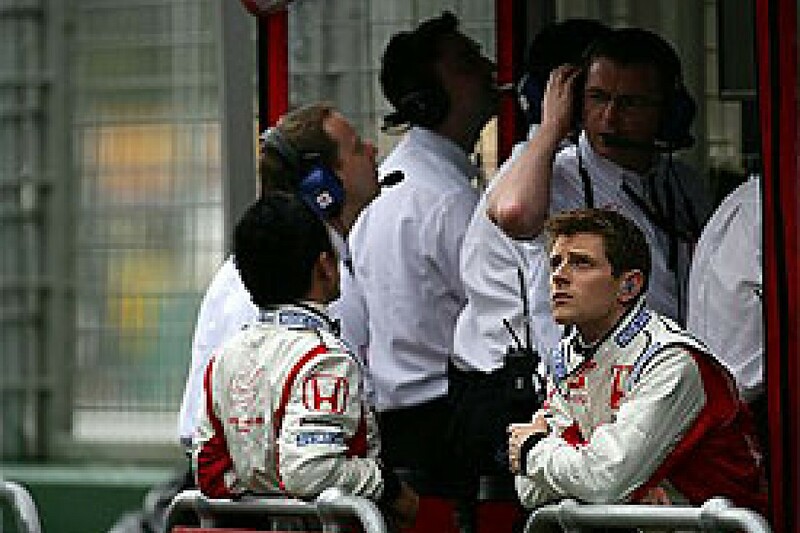 While most of the focus at the upcoming British GP will of course be on Lewis Hamilton, spare a thought for Anthony Davidson, the other driver who will be enjoying his first home race. The Silverstone crowd has always given its support to heroic underdogs as well as the home favourites, and the Super Aguri team falls into both categories. Davidson has largely been in the shadow of teammate and former F3 rival Takuma Sato this year. But that's not surprising, because the Japanese driver has been racing at the top level for a while, his confidence is sky-high, and he's in a team that was literally built around him. Sato scored points in Barcelona and Montreal, but Davidson has not been too far off him, and on several occasions, has been ahead. 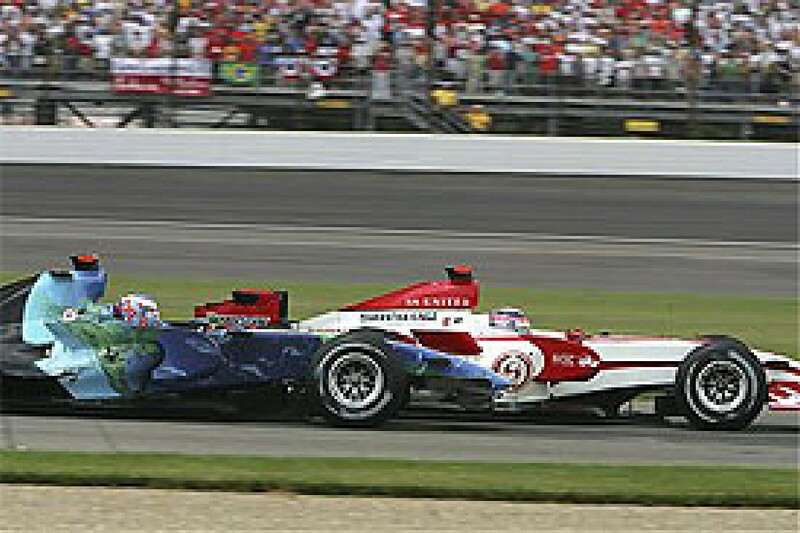 When Taku suffered a nightmare of a race at Indianapolis, Davidson at least gave the team something to cheer when he pulled off a passing move on Jenson Button. His career has taken a very different path from Hamilton's. He had done just a year of Formula Ford when BAR signed him up, and after just one further season in F3 he became a full-time tester. He soon found himself stereotyped in that role, and a couple of hastily-arranged race outings for Minardi in 2002 did him no favours. Hamilton, in contrast, did five full seasons of car racing under McLaren's supervision, skipped the test driver role, and arrived as a complete package. Davidson admits that he is still discovering intricacies of racing that were not readily apparent during all those years of testing. He's becoming more and more competitive. Q: What's your overall feeling on the year so far - it must be so much better than you expected when you first thought about joining the team? Davidson: "When I first thought about coming here, the team's attitude was that it would be a dream challenging for top 10 positions. That's obviously where they left off last year [in Brazil], and they really hoped to try and repeat that some day during the year. "It does come back quickly, but you do lapse slightly in all those areas when you're testing. I'd never been in an F1 car and in the race. 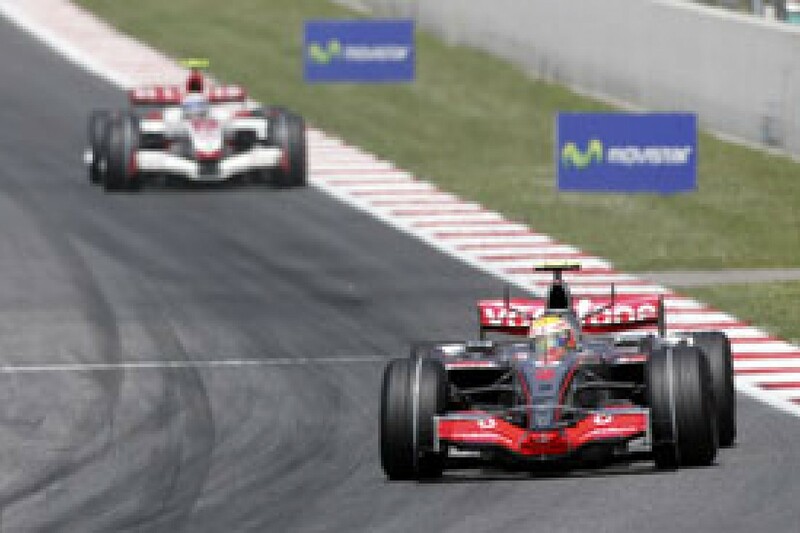 I'd done the two Minardi races right at the back, feeling like I was in the way, and didn't finish. "So that was the number one goal I set for myself in Melbourne, finish it, so that's why I drove through all the back pain after the crash. That was the minimum goal I set myself for that weekend. I think a lot of people might have given up, and if I had that kind of pain now, I would give up. "But because that was my goal for that race. I just had to do it, I had to finish. It was a problem for a week after. Bahrain was the race that I was really looking for, at least for myself. "Forget what anyone else thinks or thought of me, that was what I knew I could do, and that was the result I needed to get both in qualifying and the race. I knew it has always been there, but as a test driver it's hard to prove yourself sometimes. "I was able to show flashes off it on the Fridays throughout the two years I was testing, but Bahrain was the race I needed just for me. I felt like I got the best out of the car the whole weekend, passing people, racing well, qualifying really well. "I had a really nice balance with the car, felt confident. That's the race that needed to come early in the year, and I'm glad it came only the third race in." Q: So things really have turned out better than you could have anticipated? Davidson: "I'm ecstatic. I couldn't have wished for a better first season. It's a team that's still on the way up, and motivation is high. "We're near the back of the grid, but you're learning so much about racing, all the important things that inevitably everyone is going to have to face at some point in their career, like getting lapped. "That's such an important thing that you have to be good at, and I never realised until this year that it's such a skill. It can gain you seconds in a race that can keep you in sequence, or kick you out of sequence. Everyone has to learn it sooner or later - even Alonso was lapped in his Minardi days! It's details in a race that I'm learning so much about. "It's an incredible learning experience. In qualifying in Spain I was really pushing on and gave it everything. I got to that one corner and the rear just snapped. I caught the first snap, and it snapped again, and the car was round. "I've never been off at that corner in all my miles of Barcelona. I've done a lot of laps round there, but never in a qualifying situation with such low fuel. So it was a little bit of a new experience - just one of those things." Q: How important for the team was Taku's first point in Spain? Davidson: "A point is what we had all been working for. We didn't expect it to come at Barcelona. Normally it's such a predictable race, and normally by that point in the season the cars are fully reliable and there's no way you're going to score a point if you haven't got one of the fastest cars on the grid. "To come away with a point was amazing - it was our dream result for the year, and we'd set ourselves the goal of scoring one point for the whole season." Q: Most people, even yourselves, thought that the team might slip down the order as the rest got their act together. Why do you think that hasn't really happened? Davidson: "I think after the first three races away from home we understood the areas where the car was weak, and the areas where we could improve. We got back and had two and half weeks [before Spain] to continue development on the areas where we felt we were weak. "We felt we improved the car slightly, and I think other teams didn't find any more than what we did. You can throw as much stuff as you like on these cars, but it's rare that you find that magic half a second that you're looking for - it's really rare. "But it surprised us all to be in Barcelona at that stage of the year and still have a pretty competitive car. We've seen Red Bull break out of that midfield pack, but there are still teams around us that we can fight and beat when we nail the car, when get it spot on and we hit the sweet spot for that weekend. "I think we have a chance of scoring more points when others fall out - but we have to rely on other cars' unreliability." Q: How good is this team now? Davidson: "There's a lot of people here that have never done F1 before, mechanics especially but engineers as well. They come with fresh ideas, spirits are high, F1 hasn't beaten it out of them yet! And it's really nice to see. "I'm young and energetic and confident, and that's exactly how my engineer Antonio [Cuquerella] is, and we've got a great relationship. You become on the same wavelength, and it's great. "The people who work in the aero department are just so energetic. Everyone is just wanting to do well, and because they are on the way still, it's such a good feeling. They haven't taken a knock yet. They've come from so low down, and they're just climbing, climbing all the time. "There are some very clever people here who wouldn't be out of place in top, top teams, so we're really lucky to have a good backbone of very clever people who pull the whole thing together. I don't see them as a bottom of the grid team at all, because their mind set is not at the bottom. "There are people who look much further forward than where this little team should be. It's really amazing, they can definitely punch way above their weight, it seems." Q: Is Silverstone going to be a big race for you? Davidson: "I just see it like any other circuit. I've done more miles at Barcelona and Jerez at Silverstone, because I only did two years of car racing, Formula Ford and then F3, and even that wasn't on the Grand Prix circuit. "So I don't really know the Grand Prix circuit that well. But it's great that you've got home support, even if a lot of it is going to be focussed further up the field, dare I say!" Q: Has it helped you that all the attention has been on Hamilton? Davidson: "I think so, definitely. You want some attention of course, but it's tough. I still live in England, but I can't imagine what it's like for him coming home, paparazzi outside his door. That would freak me out. "I'm kind of glad that I'm able to just get on with racing. It's nice to be able to completely chill out when you go home, and when you come to the races just be focussed on the job. There's hardly any PR events to do, it's just racing, and my mind works so well when it's like that, especially when I'm thrown into a new situation. For me it's great, it's perfect." Q: Are you a little envious of the way things have worked out for Lewis? Davidson: "The only time when I'm envious is when he's in my mirrors coming up to lap me. You see him in your mirrors and you think, that looks so damn easy - give me a go! That's the only time I feel envious. Apart from that, best of luck to him. It's awesome that there's a Brit up there." Q: When were you first aware of him in karting? Davidson: "I saw him in pretty much his first-ever race, we've known each other for so long. We were always in different classes - he was in the same race when I was at the end of my junior cadet karting, when I was about 12, and he must have been about eight. "He was in his first year, he had the novice plates on, and he was near the back of the grid, but you could tell there was something there. We grew up from the same roots basically - Jenson, me and Lewis all came from exactly the same tracks." 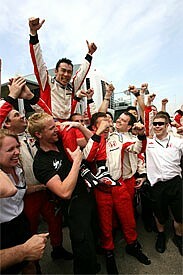 Q: Speaking of people you've known for a while, how strange was it end up teammates with Taku in F1? Davidson: "He told me a funny story. He was back in Japan clearing his room for the little 'un he's got now. He was clearing away old racing magazines, stuff he read before he was even driving, and one of them was an English karting magazine. "He looked at it and thought, I know that helmet design... And it was me on the front cover! It's funny how your paths cross." Davidson: "Obviously I was the new guy coming along, the rookie of F3. I think he could see that the speed was there, but I was no threat to him early in the year whatsoever, just because experience does so much for you. "He was even more serious about his racing then. He's still mega-serious now, but I think he's found out there's more to life than racing, with the little 'un, getting married, and all of that. He's a more chilled guy now. And I think he's a better driver because of it." Q: You must know each other so well. What's your rivalry like? Davidson: "We know it's going to be like this all year, we're both competitive little buggers, and we're quite evenly matched speed-wise, and we're going to push each other hard through the year - as good teammates should. "Again, there are no secrets there, because we've seen it all before. It's good fun, it's good rivalry, and it's nice to have another go to race him now, but this time in F1 cars." Q: Is it good in a way to have a teammate that you know so well, and you know where you stand with? Davidson: "I think so, you know where you stand with him. The only problem with him is that I think he's still underrated by the whole paddock. I think they don't see the Taku that I see. I'm really happy when I can beat him, because I know his true speed, and I think these V8 cars really suit his style a lot better than V10s. "He's just very good at carrying momentum in a car, and that's why he was so good in F3. How he went against Jenson in 2004 is how he's remembered, which is a shame, because last year he put in some mega races. You can't deny that the speed is there. "I'm happy when I beat him, and he knows that, and I'm sure he knows I'm a serious threat to him. It's great because we've got no secrets between each other, and there's nothing to hide." Q: Was it strange coming into a team that was basically built around him? Davidson: "He was here from the beginning, so it was a bit strange. But it's always going to be like that, and I think it happened to a certain degree at McLaren with Alonso and Lewis. "Even though Lewis is regarded as the new boy, he's family. So it does make a difference. It's interesting, the psyche of what a driver needs to be able to perform absolutely at 100 percent." Q: Are you looking forward to the team's home race in Fuji? Davidson: "We're a Japanese team with a hyper superstar Japanese driver. He's massive over there! I'm really looking forward to it. I'm a little bit sceptical about the circuit, although I can't really judge because I've only done it on computer games. "I don't know if it's going to be as good as Suzuka was, that was a real gem that circuit, just in pure terms of driving the track. But I am looking forward to Fuji as possibly the biggie of the year. It will be mental. There will be Super Aguri flags flying everywhere, Taku flags, Anthony flags, it's going to be really good." Q: Were there times when you thought you wouldn't get out of the cycle of being a test driver? Davidson: "It's really tough to impress people enough to give you the chance to race when you're just testing. You can do as many quick laps in a row as you want, you can go quicker than the race drivers day after day in testing, but it seems it just doesn't give sponsors and team owners the confidence to put an unknown quantity into a car. "You can argue whether it's right or wrong, but it's frustrating when you know in yourself that you're good enough to be out there with those guys, and you're just not being given the chance. "It was more frustration that losing hope. I always thought there was hope, seeing people like Alex Wurz, Pedro de la Rosa get another chance. 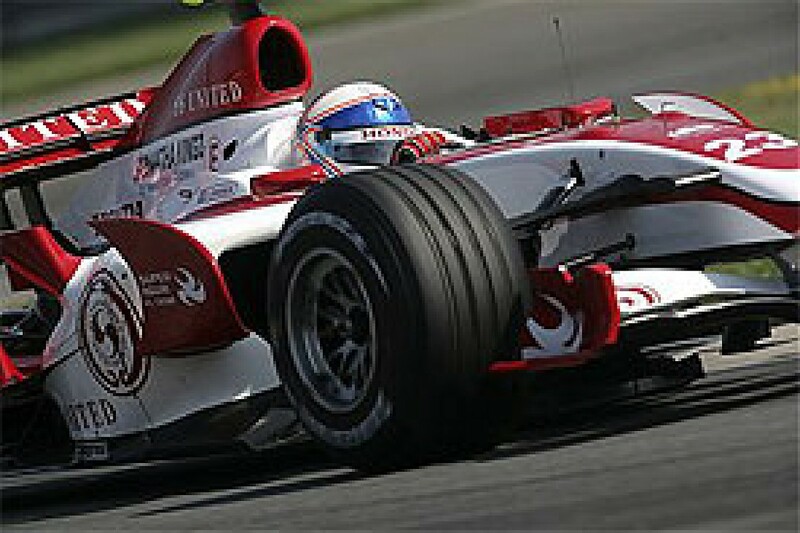 And you see how Nick Heidfeld's career has been, or guys like Allan McNish even, that got a chance. "In such random, bizarre ways, people get a chance. It's the same reason why Christian Klien is hanging on in there - as long as your foot is still a little bit in the door, there's always that glimmer of hope that it might just work out, it might just come good." Q: Any regrets about decisions you made, or was it a case of not being able to take opportunities because you were tied to BAR or Honda? Davidson: "There were opportunities that were stopped or just didn't come around. The only thing I would say I do regret is doing the two Minardi races. It was just too early. "I was in my first season test driving, completely unknown car, midway through the season, one of the toughest tracks in the calendar [Spa], a highly regarded teammate [Mark Webber] who hadn't really been regarded at that point. I just regret doing it so much." Davidson: "That should have been a sign, when I had to wear mechanic's overalls for the race. I think I should have taken it as a big hint and not done it! That was a big learning experience again..."